Excuse Patrick and JB while they whip this out. Great insight on all things, guys. I love "Blazing Saddles" and this just goes to the comment Adam made about missing funny movies. I always struggle with Comedies these days and it drives me nuts with the crap that the studios think is funny. I would think "Magnolia" set the bar for the connection thing more than "Crash". "Men Woman and Children" was woeful, yes JB, "Crash" is much better. I really wanted to like "Marrow". Maybe in a setting with others it would have been a bit more fun. I have found that to be true with certain films. Magnolia is one of my favorite movies ever. Even before Magnolia, though, I think you have to look at some Robert Altman movies. Nashville and Short Cuts both have these big casts with lots of different stories that sort of come together or maybe don't. There are probably other ones of his too that I haven't seen. KIND-OF SPOILERS FOR MAGNOLIA: I feel like Magnolia works because it plays on your expectations for those kind of movies and doesn't quite pay off like you think it will. Magnolia is a masterpiece. Definitely my fav. PTA film. Good call on Altman, that didn't cross my mind. Could Pulp Fiction really be the modern genesis of "multi-plot?" That crossed my mind as well. I think it was done in such a stylistic "cool" way that it has influenced younger filmmakers to try an emulate it for better or worse (most times the latter). Pulp Fiction was also a descendant of Kubrick's The Killing, so maybe we are just going through the cycle's that naturally occur. So far when I try to download the file (on mac), it changes into a html document when it hits the desktop. The archive site we use to host completely changed things around and something must be messed up. Also iTunes is down right now. The whole thing is a disaster. Working on getting it figured out. Sorry about that. 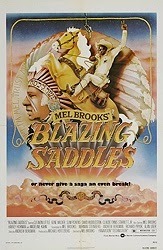 The Producers, Young Frankenstein and Blazing Saddles were definitely the prime of Mel Brooks' work. It's unfortunate that if eventually dropped off. I recently revisited Spaceballs because my sister wanted to watch it, and I can honestly say I laughed at almost none of it. The one thing that still kind of works for me in that movie is "comb the desert," which I continue to think is a funny visual. The rest of it is rough. I have some residual affection for Robin Hood: Men in Tights, too, but I'm thinking if I revisited that one, my feelings for it would experience a significant decline. Intestingly enough, it seems like maybe Gene Wilder was a key element to the good Mel Brooks movies: He co-starred in The Producers, he had a part in Blazing Saddles, and he starred in Young Frankenstein. Those two should have continued to work together. I watched Blazing Saddles a couple years ago with some 20 year olds who'd never seen it before, and the humor was totally lost on them. They just groaned through the jokes like they were corny and hack. So if Blazing Saddles doesn't play with modern audiences, I would think it's just a product of how much it's been ripped off. I love this movie. I don't think this film holds up for a modern audience because it could never be made today. It is in some ways charming because of the blatant disregard for morals and jokes that sting, but only because we live in an evolved society today. This movie is great and very funny, but only for an educated or perhaps older audience. I'm amazed at the care and respect that people have for this movie that does things that people would never dream of doing today. This truly is a movie that you could say "They don't make them like they used to." I could listen to JB's Chappie meltdown all day long. Ba-da-doo-doo Bee-da-dabba Chappie? Boo-ba twee-twee-twee-twee Adam? You like black sheep. Chappie know what black sheep is? Hey gang, cool podcast as usual. In quick regards to Chappie I kinda liked it, even though I will admit it’s a mess. The movie this reminded me of the most was Robocop 2 specifically, what with the attempts at humor and the over the topness of all the villains (I want f’n everything!). All that being said the movie is very well shot and the special fx are top notch. I have hope for Alien 5 as long as Blomkamp isn’t writing it which unfortunately I think he is, odds are Ripley will be in the load lifter from Aliens the whole time. As to good old Mel Brooks, The Producers, Young Frankenstein, and Blazing Saddles is definitely the top tier trilogy from him where things were just firing on all cylinders. I kinda like Silent Movie but as a whole feature doesn’t work all the way. The same basic thing with History of the World Part 1 and High Anxiety (to this day though if I have had a rough day traveling I will say “what a dramatic airport”). Spaceballs is kinda the same although man the bits that work for me in that movie REALLY work even though some of it is way too simplistic. (All the yogurt jokes). Life Stinks I think is probably his last film that I felt worked as a whole even if it doesn’t have a ton of jokes in it. Robin Hood: Men in Tights is where things get pretty weak and Dracula Dead and Loving it gets by only on my affection for a fun Leslie Nielsen performance. All the negativity aside though, I truly believe his Producers musical show is one of the best musicals in history, with tons of jokes and heart to go around. It’s a crying shame he didn’t actually direct that one himself.